For nearly one century, the former Governor John B. Smith House in Hillsborough has been home to the Fuller Public Library and various town offices. In 2008, the state fire marshal found that the William M. Butterfield-designed Queen Anne and Colonial Revival building was unsafe, and only the first floor of the library was allowed to remain open. 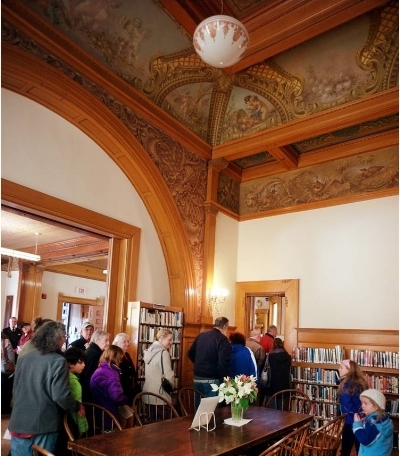 For the past nine years, the town and library worked through a phased restoration of the building to meet life safety code standards and increase access to all. With the help of a $500,000 bequest, LCHIP funding, and plenty of fundraising, the building received a LULA lift to service five stops on four floors, a fire escape, upgraded HVAC and electric systems, new paint, refinished floors, and a fire rated corridor. This signature Hillsborough building now showcases its late 19th century splendor while meeting the needs of the 21st century. The interior of the John B. Smith House boasts incredible wood work and murals. Photo courtesy of Bob Woolner.